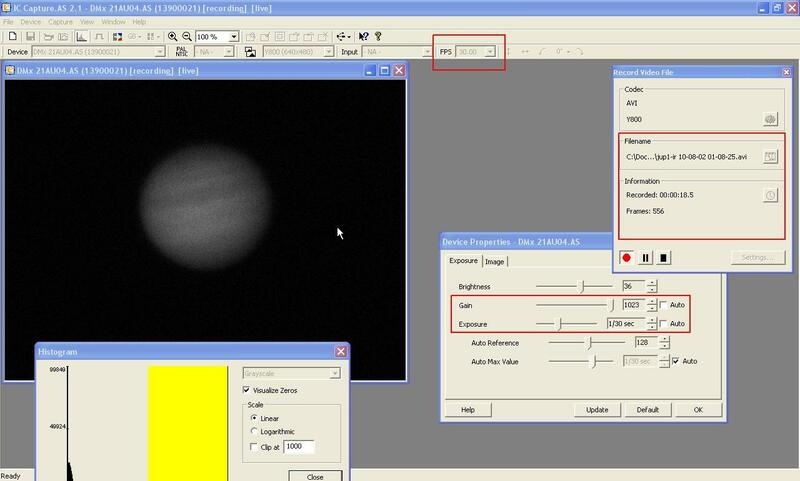 This article contains tips about imaging planets using monochrome camera - DMK21 - the old model, not DMK21AU618. Most of the tips should apply to other similar cameras as well. DMK21 is capable of recording AVIs up to 60 FPS, but at 60 FPS mode circular artifacts occur so safe speed is only 30 FPS. The same problem exists in many other industry cameras. DMK is equipped with CCD sensor - ICX098 which offers quite decent sensitivity. The camera can produce very good results but nowadays there are better superior designs with newer CCDs and without the artifacts. So here are some tips to squeeze everything from the DMK21. To record an AVI you can use IC Capture AS or free application called FireCapture. They both work, however IC Capture can crash from time to time when ending the recording. FireCapture offers some extra features like ROI, binning or centering the planet on saved frame. Both have the same speed, gain and exposure time settings. You have to check that the camera is not working in 60 FPS mode. The speed mode is given on the top bar of the application. To record an avi we need two windows: Capture -> Toggle Record Info Dialog and Device -> Properties. First one allows us to start and stop the recording as well as set prefixes for recorded AVIs. Properties window allows us to control exposure time and gain. DMK21 on planets works best on exposures not longer than 1/30 of a second. On longer exposures it's slower and the noise noticeably increases which usually prevents from getting good frames even if the seeing is good. Lowering gain decreases the brightness of the object but also decreases the camera noise. When imaging moon or sun it's good to lower the gain for better frames. For planetary - stack of over 1000 frames on max gain will take care of the noise induced by the gain. You can also open a window with histogram. It shows how bright the object is. The yellow area shows empty histogram space. Good starting point is to have half histogram filled. If the seeing allows you can use slightly longer exposures to get more histogram fill. If the seeing is bad you can try with slightly underexposed frames. To get good results from DMK21 AVIs you need at least 1000 frames. For Jupiter I use about 1200-1500 frames per channel, but longer 5000 AVIs/Stacks show some improvement in the noise level of the final stack (planet rotation can be a problem!). Pro Planet 742 works at focal ratios up to f/20 on Jupiter. At f/28 it's too dim and I use red as the luminescence. Add prefixes of the avis for each filter, series or settings. FireCapture saves all settings for each AVI. Gather as much frames per channel as you can. 1000 frames is a minimum.